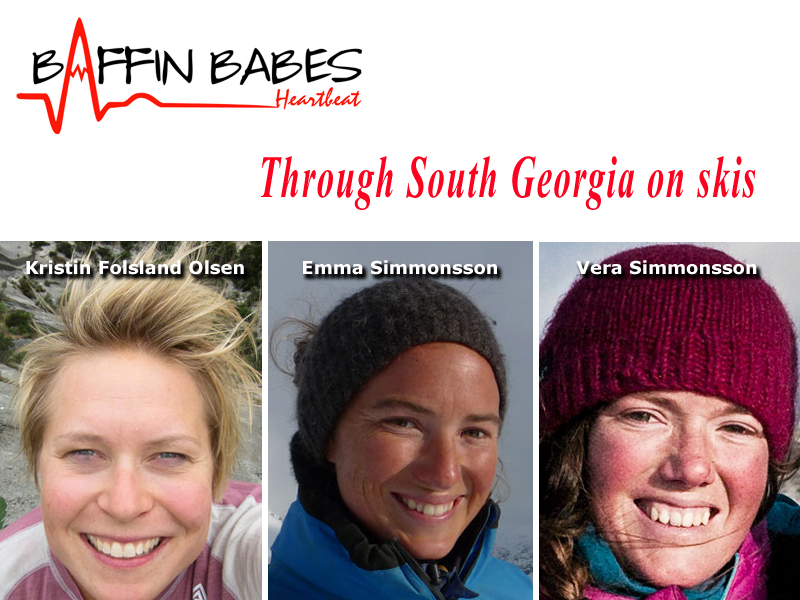 Three adventurous Norwegian women are heading south to undertake the crossing of the sub antarctic island of South Georgia. They will travel by ski. From the Press Dossier : "The big goal of the year is to cross the sub antarctic island of South Georgia on skis. Among waddling penguins and sharp peaks, we will be away for a month. Katabatic winds, steep and difficult terrains, and difficult logistics will challenge us, and we are more than ready for this exciting task! We will also get to experience the varied and dramatic scenery, and an abundant wildlife." Kristin Folsland Olsen works as a journalist, photographer and lecturer. She is living in the Lofoten Islands, where she spends most of her time in the mountains or at sea, and between trips she provides articles and photographs to various magazines.This excited traveler has contributed to several books and also takes on guided tours in rugged terrain, in Greenland, Svalbard and the Lofoten Islands among others. Emma Simmonsson works as a lecturer and activity director for children and immigrants for the recreation department in Molde.The “queen of the outdoors” derive her energy from the mountains and the sea, and spends quality time under the open sky. The camera usually comes with on trips.Emma is very socially engaged, she has studied social aid in Gothenburg, volunteers for refugees and has worked with street children in Lima. Vera Simmonsson is trained as a glacier guide, and is currently part owner of the company Vega Expeditions.Vera works as a lecturer and for years she has led expeditions by boat, dog sled and ski in the Arctic and Antarctic.In 2009 she received the award “The year’s female adventurer” in Sweden. Vera also provides articles and photos to national and international magazines.